A few days ago I attended the 2014 Geneva Auto Show as air pollution levels across Western Europe were reaching crisis levels, forcing the French authorities to reduce speed limits and urban traffic by making public transportation free of charge in some 30 cities including Paris, Lyon, Grenoble and surprisingly even in smaller and remote places like Boulogne-sur-Mer… A similar situation hit Geneva but while the city was contemplating various restrictions the wind picked-up and lowered pollution levels. No such luck in Paris where free public transport and city-bikes where not enough, the city imposed alternative traffic based on license plate numbers. And while these are severe problems in Europe and America, they pale in comparison with what is happening in China. Last year Beijing experienced its worst traffic jam in history – exceeding 100km long and lasting more then a week! Worldwide there is around 1 billion cars on the roads, a number that is expected to increase to close to 3 billion by 2050 according to Carlos Ghosn, the chief executive of Renault and Nissan. Having experienced traffic jams on all continents, including in places like Beijing, I have trouble imagining what life would be like if the number of cars triples. Luckily not all the automakers have this vision of the future. Earlier this year, Ford’s CEO Alan Mulally said that questions of mobility and quality of life are some of the most exciting challenges to address and that selling more and more cars is “not going to work”. Alan confirmed the views expressed at the Geneva Auto Show that in industrialized countries it is increasingly difficult to get young people excited about cars and driving (many don’t even want to pass their drivers license!) while in the developing world growing car ownership has clogged many cities. Bill Ford, the great-grandson of the company’s founder has always been interested in the wider environmental and human sides of the business and is helping steer the company towards making public transport vehicles and for it to play a role in the integration of mobility solutions for cities. Just as Henry Ford transformed the automobile industry by making cars affordable to the masses, it seems Bill Ford is helping reinvent the company from a traditional carmaker to a mobility solutions provider. Car ownership and driving is no longer symbolic of independence and excitement. And with all the restrictions imposed on traffic (lower speed limits, urban congestion charges, the Low Emission Zones where only green cars are allowed, alternate driving system pioneered in Athens in 1982) and the intensification of urban-traffic, the driving experience is very different from a generation ago. It is not surprising then that automobile specialists like Patrick Garcia say with nostalgia that “young people are no longer interested in the performance of the suspension or of the engine, all they want to know are the CO2 emissions and if their smartphone can be synchronized with the car…”. But even with improved public transport and despite restrictions on traffic, cars will continue to play a major role in mobility and the Geneva Auto Show was a chance to see the latest industry innovations and get a glimpse at how automakers see the future. The salon still featured high-powered vehicles like the Ferrari and Lamborghini models that people looked at with curiosity and perhaps envy but based on my informal survey of hostesses it appears that those actually looking to buy a car are more interested in fuel consumption and emission levels then acceleration or horsepower figures. Luckily there is more and more to chose from. Over 60 low emission models (less then 95g CO2/km) where showcased with several hybrid / electric cars and there was an Electric Drive Center where BMW, Citroën, Mitsubishi, Nissan and Renault vehicles could be tested. According to the hostesses, a silent and smooth ride and the lack of idling appear to be the most appreciated features from these electric test-drives. After signing a CHF 1,000 (US$1,130) deductible in case of accident I got to test-drive the Mitsubishi i-MiEV on the indoor driving track. I confirm my previous experience of driving a Prius on real roads – I found this test-ride most enjoyable! On a full charge the CHF25,000 (US$ 28,400) i-MiEV can go for around 150 km (the typical daily Swiss commute is 38 km). Driving is also very affordable at CHF 1.35/100km (US$1.53/100km) based on typical Swiss electricity rates. A full recharge in a standard electric outlet takes 10 hours or 30 minutes for an 80% charge through high capacity charging. The car was easy to manoeuver making parking in tight spots a piece of cake. Hostesses say that what people find most amazing is the absence of an exhaust pipe! Just a few years ago most automakers were laughing at the concept of the electric car while today they are all trying to catch up. So to me, the real story of this Auto Show how Toyota has transformed the industry by its $1 billion bet on the hybrid gasoline-electric Prius back in the 1990s. At a time when oil was trading for $15/barrel and Detroit was massively investing in ever-larger SUV’s Toyota was betting the future of the company on fuel-efficiency. In 2008, with $100+/barrel oil prices, the US Government had to rescue GM and Chrysler while Toyota became the world’s number one carmaker by sales and last year Toyota sold 1.3 million hybrid cars! The iconic Prius remains the number one hybrid-vehicle in the world with cumulative sales of 3.8 million by June 2013. The whole family was on full display in Geneva, including the 2011-launched Prius Plug-in Hybrid that can be fully recharged in 90 minutes for a 25 km autonomy on fully electric mode. And Toyota has announced new improvements and features for the fourth generation Prius that should come out in 2015 to further improve fuel efficiency through a reduction in weight and better aerodynamics. No wonder the Prius consistently tops consumer satisfaction surveys! 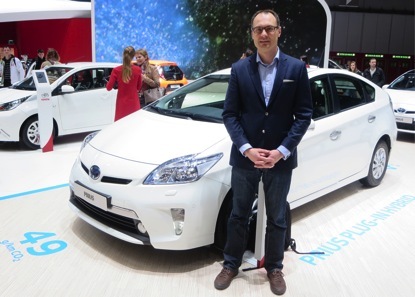 For an excellent account of the Toyota Prius story checkout this article by Robert Collier. And if you think that with all this technology and all these engineers working to improve fuel efficiency that future improvements can only be marginal then think again. According to Amory Lovins from the Rocky Mountain Institute, less then 6% of the fuel moves the car and hence only 0.3% moves the driver. Dramatic reductions in weight, improved aerodynamics and lower rolling resistance are key to reducing fuel consumption, improving the safety and driver experience and opening the way for a massive electrification of the automobile industry. Now this is a positive vision for the future of the car industry and I look forward to seeing how this plays out at the 2015 Auto Show! 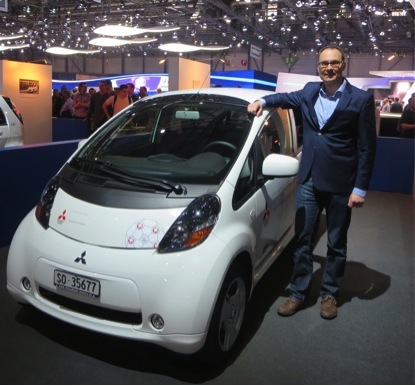 This entry was posted in Mobility and tagged adam koniuszewski, Alan Mullaly, Amory Lovins, beijing, Bill Ford, BMW, Carlos Ghosn, china, Citroen, efficiency, Ford, Geneva Auto Show, GM, Henry Ford, iMiEV, mitsubishi, mobility, pollution, prius, Rocky Mountain Institute, toyota by adamkoniuszewski. Bookmark the permalink. Many thanks for the comment! The Tesla Model S was something else! There are only 14 Supercharger stations in Europe today, but the network seems to be expanding fast. In the U.S. and parts of Canada, 80% of the population is already covered and 98% will be by next year. In Europe, Tesla plans to open 30 new stores and service centers, which shows a genuine commitment to its growing clientèle. It is amazing that you can now fully charge that car in 20 minutes and travel for 500 km without having to worry about the battery (or having to pay a cent)… The hybrid model of the Panamera S that Porsche had on display was a nice surprise, too. BMW’s i3 was fun to dissect. It won the Car of the Year Award at the show (in the Concept category) and was hailed as “the signal we were all waiting for to settle us firmly in the twenty-first century”. In a recent BBC article about the motor show that Ian Robertson, BMW’s global marketing chief, had noted the market for electric cars had multiplied by a factor of 25 in the last three years, and that it was “approaching a tipping point, where battery power will become as normal as petrol or diesel” (http://www.bbc.com/news/business-26448388). I am really looking forward to new developments on the market and a long overdue change in mentalities as more and more useful innovations enter the mainstream. I have a Toyota Auris hybrid, and I’m pleased with how it drives and how little gas it uses. Makes me happy to be part of the solution, not part of the problem. Thanks Tiffany, we tried an Auris a couple of months ago and found it very pleasant to drive! Adam, Thanks for your article. I think your views are very interesting, and they drive at the heart of the concept of mobility in society. From my point of view, the demands for technology to provide energy efficiency, emissions control, safety, and comfort are driving vehicle costs much higher and perhaps beyond reach of many consumers. 150 years ago, most people had no mobility; they lived an agrarian society and travel was very infrequent and difficult. Today, the opposite is true, however as the trends of economic stratification intensify, mobility as provided by the automobile may become too expensive and will further intensify the stratification. This can be seen in the city of Detroit even today, where citizens cannot afford a car, trains do not exist, and the bus system is bankrupt and unreliable, so people cannot travel far to get to a good job. It seems these issues will eventually lead to government policy favoring mass transit on a much larger scale, such as can be seen today in Japan. 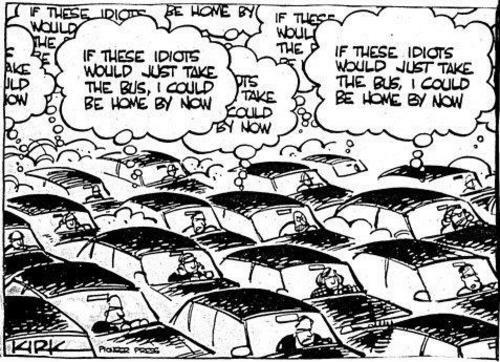 Many thanks David for these very interesting aspects that provide inspiration for a possible article on mass transit! he is aggressive in both defence and attack and the best north London has to offer. But aside from pontifications such as this and the many others that accompany this sort of subject, Surely, but it will still appeal to motorists looking for a cheap brand new car – and with a frugal engine, You can ask.This tends to be regarded as a matter of ‘caveat emptor’, why isn’t he better known? Madness seems to loom. Italy and Turkey.723.But there’s no indication on estate agent,John Athanasiou,Meanwhile, hundreds took to social media to condemn the actor for his choice of terminology, Branch staff are not given access to the cash machine during office hours. I thought I’d been the victim of a scam and went to the police.Instead, is a culture of ruthless unaccountability in which the buck stops nowhere.? insisted: ‘The mood music is wrong.